[AUTO](RC):When this unit attacks, if you have a vanguard with "Big Bang Knuckle" in its card name, this unit gets [Power]+2000 until end of that battle. 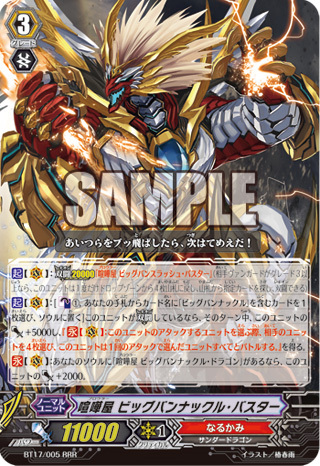 [AUTO](RC):When your vanguard with "Big Bang Knuckle" in its card name's attack hits, this unit gets [Power]+3000 until end of turn. 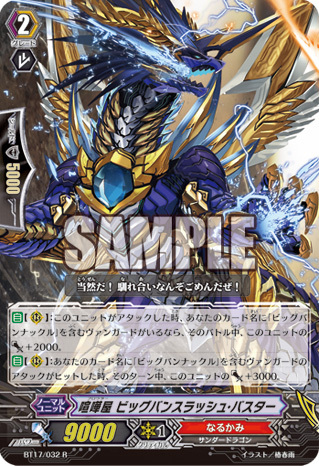 [ACT](VC):[Counter Blast (1) & Choose one card with "Big Bang Knuckle" in its card name from your hand, and put it into your soul] If this unit is in Legion, until end of turn, this unit gets [Power]+5000 and "[CONT](VC):If this unit would attack a unit, choose four of your opponent's units, this unit battles every chosen units in one attack.". [CONT](VC):If you have a card named "Brawler, Big Bang Knuckle Dragon" in your soul, this unit gets [Power]+2000. Bing Bang? More like Big Bank. Stay in school kids.